The Milanese Miracles | Sleep Late Tomorrow! I confess myself quite the expert at this wonderful art, much to the annoyance of my parents as I was growing up. As a grown up however, it takes something special to rediscover the meaning of this phrase. The meanderings of my adult life found me one fine evening, taking the Euro rail from Zurich to Milan, the city that Leonardo Da Vinci made his home for more than 17 years. It was here, in the process of attempting to discover everything that I stumbled upon the wisdom of this saying once again. On the train ride, I had a ton of deliverables and deadlines to meet. As I labored away on my laptop, an old Italian couple sitting across from me seemed bemused. The lady looked at me, then looked outside as if to gesticulate to something. As I looked up, I saw the Alps on one side, and sprawling greenery on the other! With my jaw still on the floor, and the couple now openly laughing at my wonderment, I sheepishly shut my laptop and settled down to start my rediscovery of “Dolce Far Niente”. As the train rolled through villages, and into the suburbs of Milan, I was strangely reminded of India. The same joyful disarray, and content happiness with absolutely nothing, made me homesick. Home was put far away from my mind however, when I settled down to enjoy my dinner that night- A quintessentially Italian meal of spaghetti carbonara with fresh mozzarella and the most delicious tiramisu I have ever had. Stereotypical, yes, but needed to be done never the less. At this point, I must point out, that the traditional cuisine of the Lombardi area, which encompasses Milan, is risotto, not spaghetti, but I just couldn’t resist. I am a proponent of exploring a city without tour guides. It gives you an opportunity to research the city before hand, and pick out the places that might interest you. This also enhances your experience of the city, as you have the freedom to be lost in its sensations, which is usually when you make the most stunning discoveries. Each city has a unique flavor, and it’s never the same for everyone. 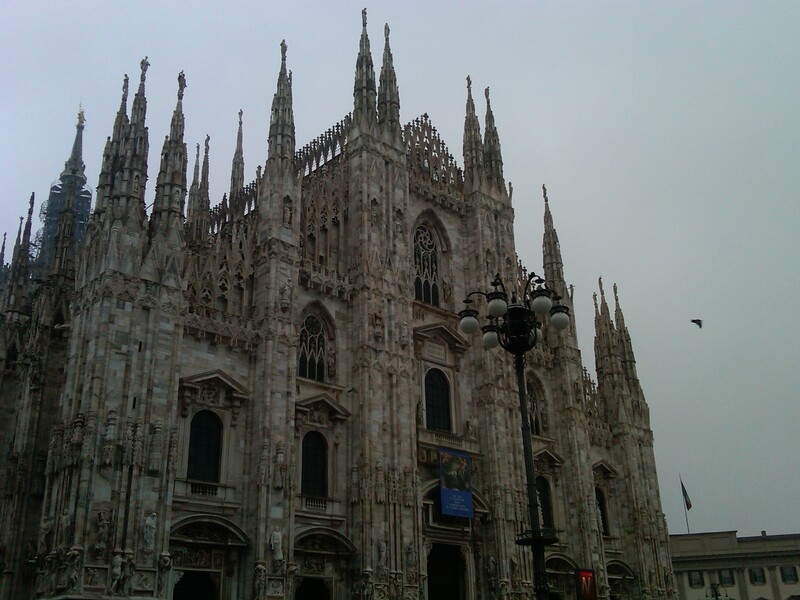 However, towards the end of my visit in Milan, I was forced to hire a tour guide, and regret it to this day. We’ll soon find out why. My first stop was the Castello Sforzesco or the Sforza Castle. This was the seat of the Duke of Milan, who was one of Leonardo da Vinci’s biggest patrons. Castello Sforzesco boasts a rich history and extraordinary art. Although the castle hosts a variety of exhibitions ranging from Egyptian artifacts to ancient antique furniture, My favorite pieces are –“The Ceiling Paintings” by Leonardo da Vinci, and “The Rondanini Pieta” by Michelangelo. 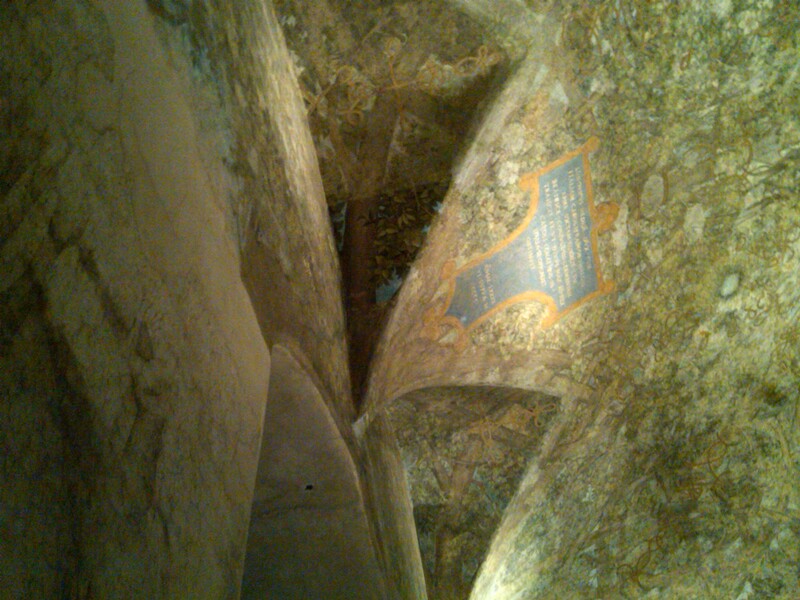 Leonardo’s artwork within the castle is the only ceiling painting that he ever attempted. It is a representation of nature and its bountiful growth, as well as the repetitive nature of life- a powerful tribute to the natural world. 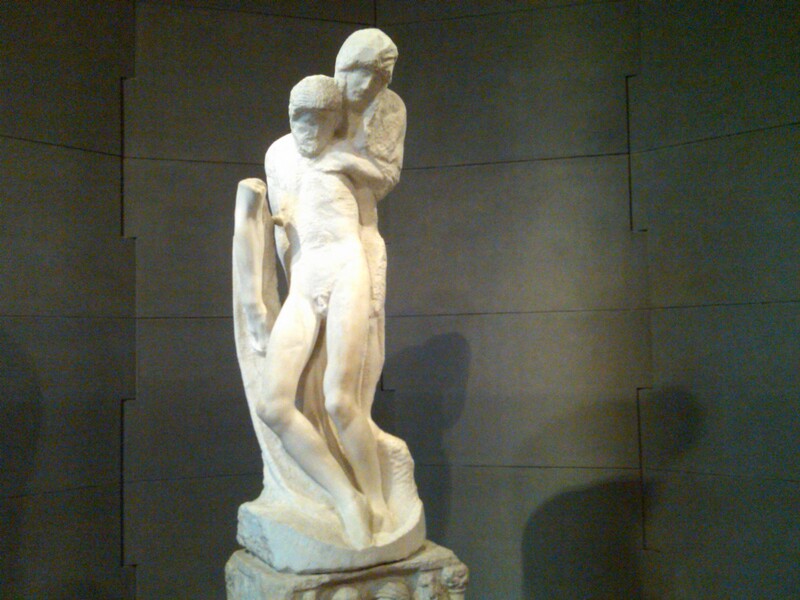 On the other hand, “The Rondanini Pieta”, which is the last piece Michelangelo worked on shortly before his death, is a representation of human frailty and mortality. Although unfinished, it offers a rare glimpse into the perishing vitality and ascending spirituality of the great master’s mind towards the end of his life. 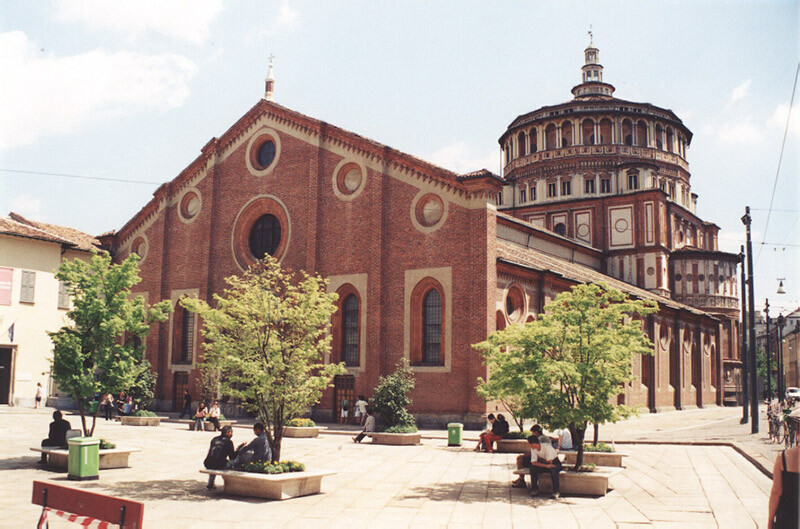 Milan also houses a significant portion of the “Codex Atlanticus” – Leonardo’s famed scientific diaries. 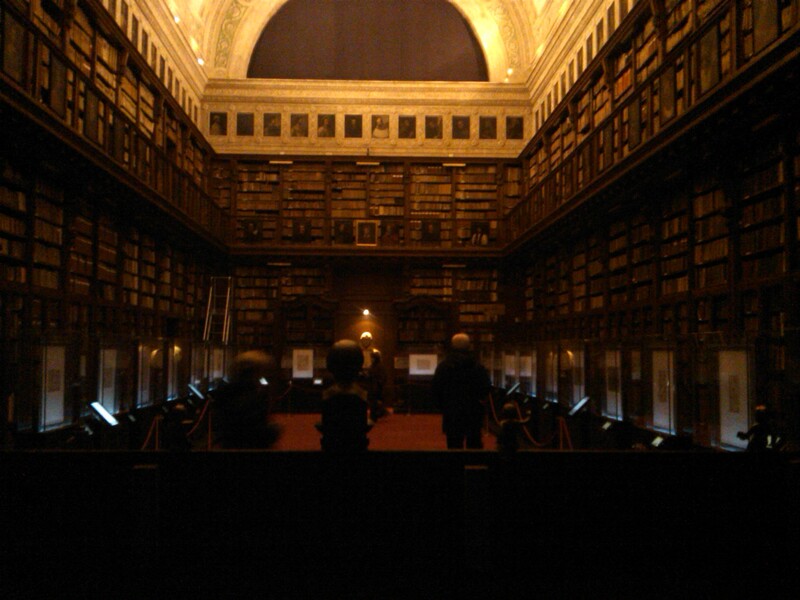 They are mostly stationed at the “Biblioteca Ambrosiana”, which was my next stop. Leonardo was a prolific scientist, and an avid chronicler of the human anatomy. His engineering drawings, biological studies, as well as random doodling are compiled under the “Codex Atlanticus”. 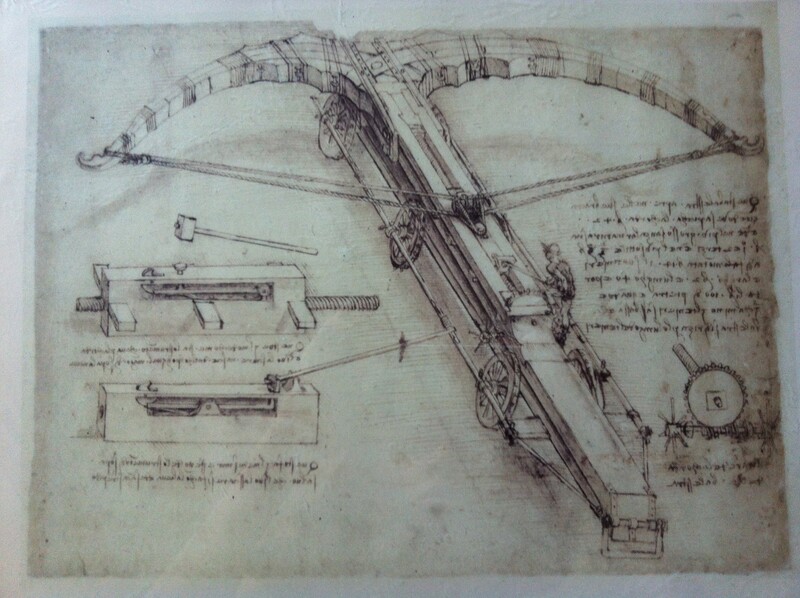 It is a revelation to witness Leonardo’s vision for earth moving equipment, scuba diving apparatus, helicopters, and numerous warfare paraphernalia. To the average human mind, the profuse range of his genius is astonishing. The mirrored writings, the delicate designs, and the astonishingly well-preserved parchment leave you mesmerized. To be so close to a page that Leonardo once wrote upon makes you feel like if you extend your hand just a little bit, you can touch genius! No matter what else you do, you cannot miss Milan’s gothic architectural masterpiece: The Duomo, which is the seat of the Archbishop of Milan. The Duomo is the fifth largest cathedral in the world, and is famous for a truly astounding artifact- It houses one of the nails from Jesus Christ’s Crucifix. This nail is put on display for the public to see once every year. A small red light above the altar indicates the position of this nail. Now whether you choose to believe that this is a true part of history, is up to you. However, it represents a great faith and grace for the people of Milan. On the off chance that it actually is an unaltered artifact, it is an unparalleled opportunity to see a piece of history that has shaped our modern world, and will leave you humbled. 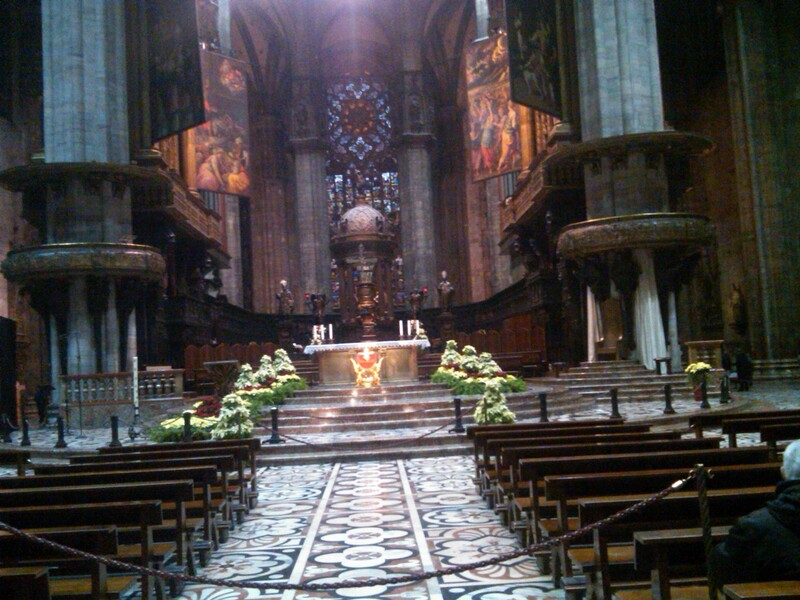 The Duomo is full of sculptural and artistic masterpieces. The rooftop of the Duomo is open to the public, and is an opportunity to see some of the best specimens of Italian sculpture as well as a fantastic bird’s eye view of Milan. 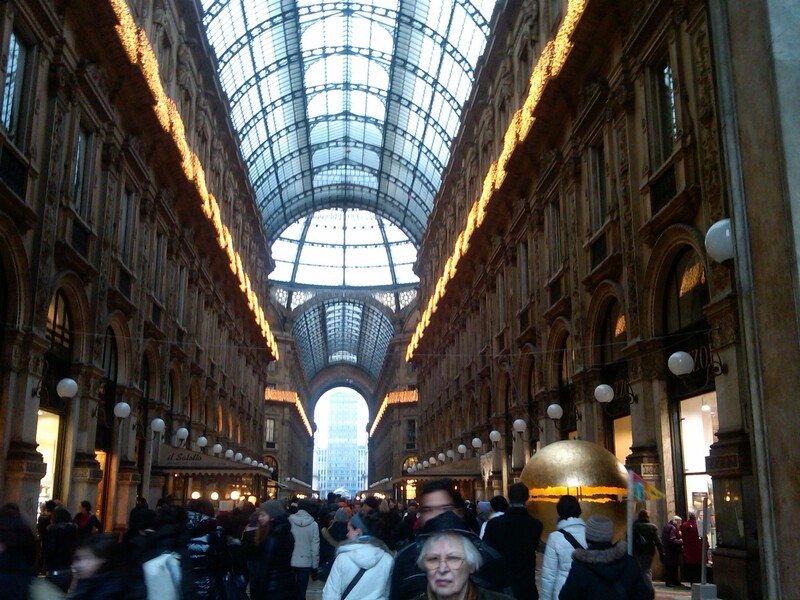 Heading out of the Duomo, you enter Milan’s Galleria. Now when you step into the marketplace in the Galleria, you will notice a lot of people at any given time on any given day gathered at the center of the Galleria. At the center of that gathering, you will see a blue bull. 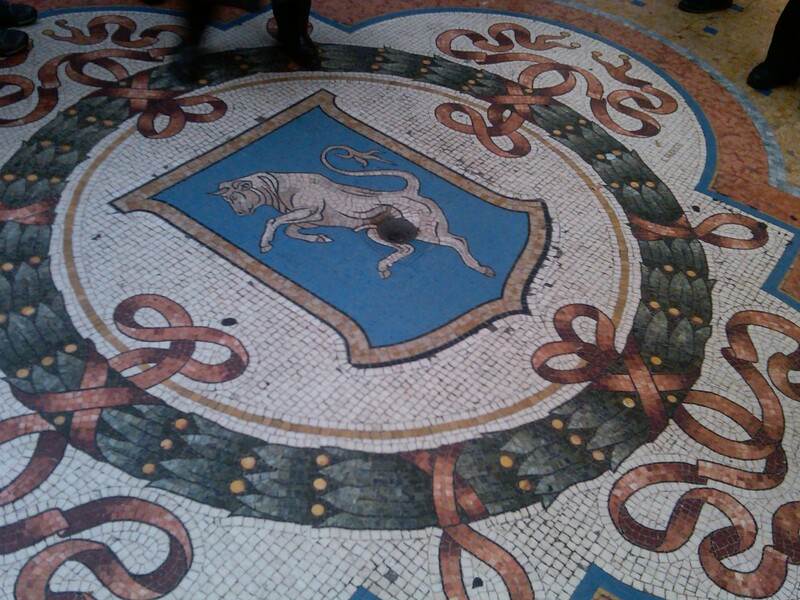 The legend goes, that if you turn on your heel once on the bull, you will be destined to return to Milan once again. Whether or not that’s true remains to be seen, but it sure is nice to be part of a legend. However, while you soak up all that the galleria has to offer, make sure you hold on to your cameras and purses real tight. Italy is infamous for its pickpockets, and you really don’t want to leave with that legacy! One of the most interesting things about Milan, which connects it to the United States, is that, you will see old 19th century wooden trams rolling down the roads just like the ones you see in San Francisco. The Milanese trams were the original inspiration to build them in San Francisco. In fact, they even transported an original 17th century tram from Milan to San Francisco, which is now on exhibit. 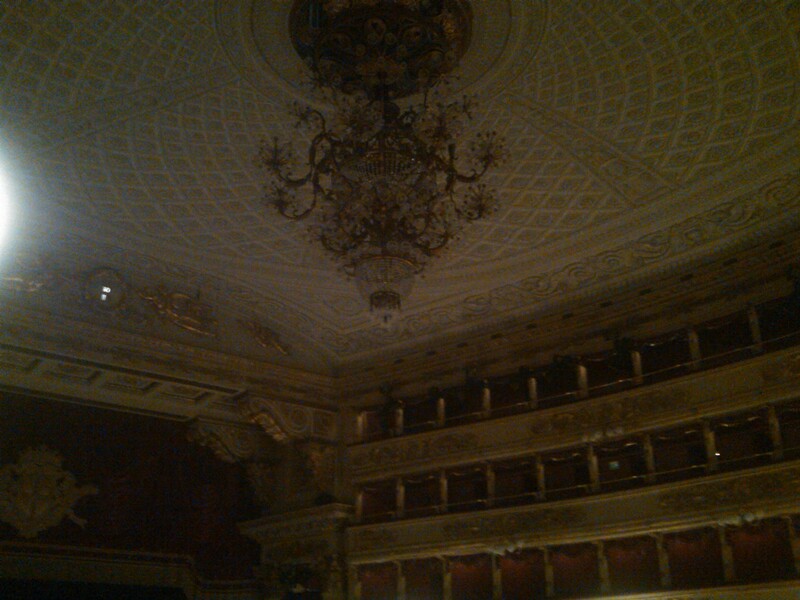 A visit to La Scala, the Milanese opera house is a trip that a lot of people make. To me it was special because of my interest in Tin Tin comics, and especially the ones with Bianca Castafiore in them, who sings on multiple occasions at the La Scala! Seeing something you read about as a child is a thrill that I can never explain. Only the ones who experience it will know what I’m talking about. My favorite is Caravaggio’s “Christ breaking bread at Emmaus”. This is indubitably one of the best pieces that Caravaggio has ever painted. 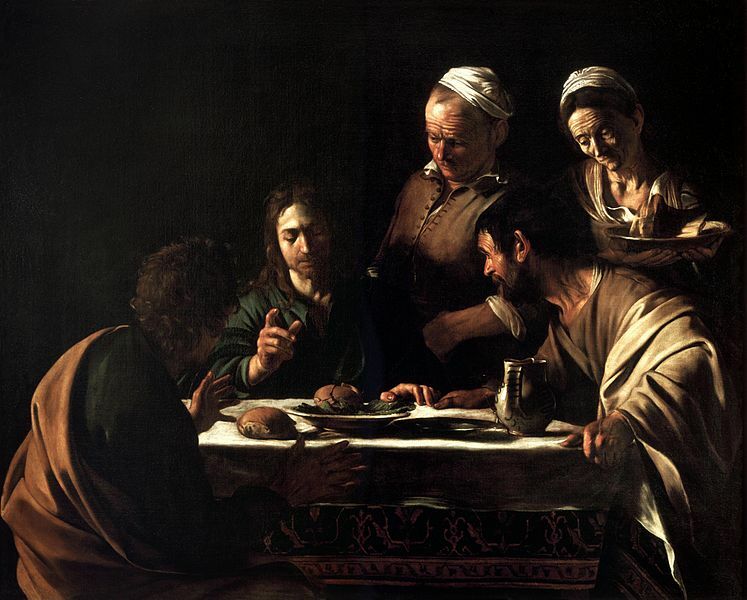 As I have written before, Caravaggio was one of the pioneers of Chiaroscuro, the study of light and shadow. His work is exceptional and years ahead of his time. In this piece, he uses this technique to subtly portray power and humility at the same time around Christ’s face, giving him a natural halo. 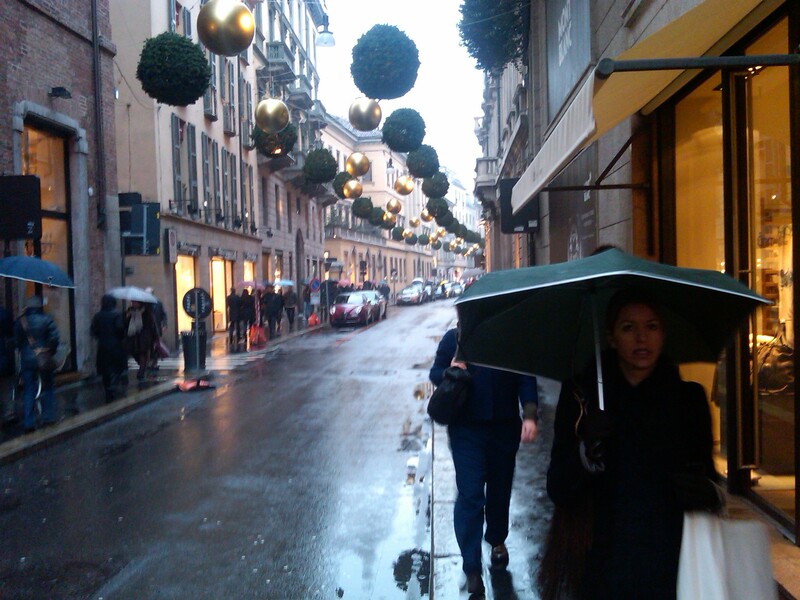 However, if Pinacoteca Brera is not your cup of tea, then there is always a visit to the fashion street of Milan to lift your spirits – Via Monte Napoleone. This street houses some of the most elegant, not to mention expensive fashion houses in the world- Gucci, Prada, Armani, Louis Vuitton, Dior -the works. Even though all I could afford to do was window shop, it is really fascinating to think about how this ultra elite and yet superficial industry contributes to millions of jobs and billions of dollars in economic turnover. 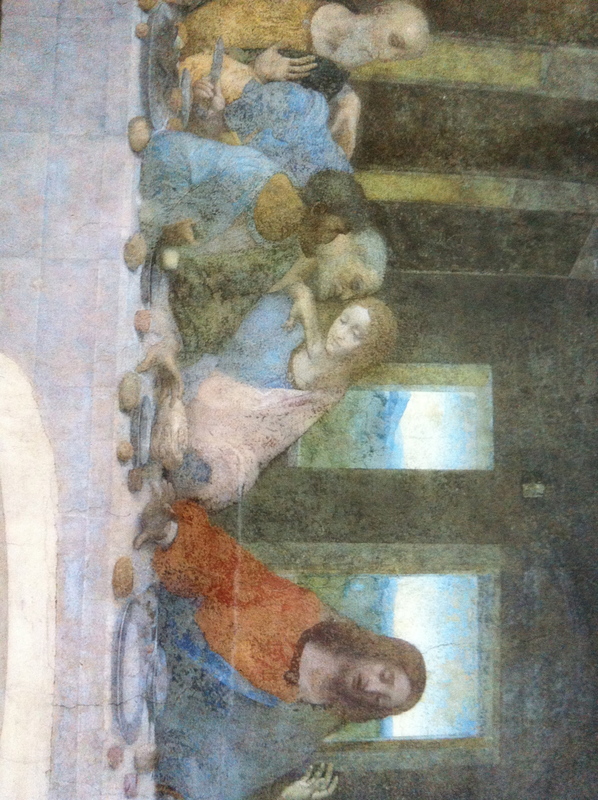 At long last, I came to the real reason I visited Milan- The Last Supper by Leonardo Da Vinci. 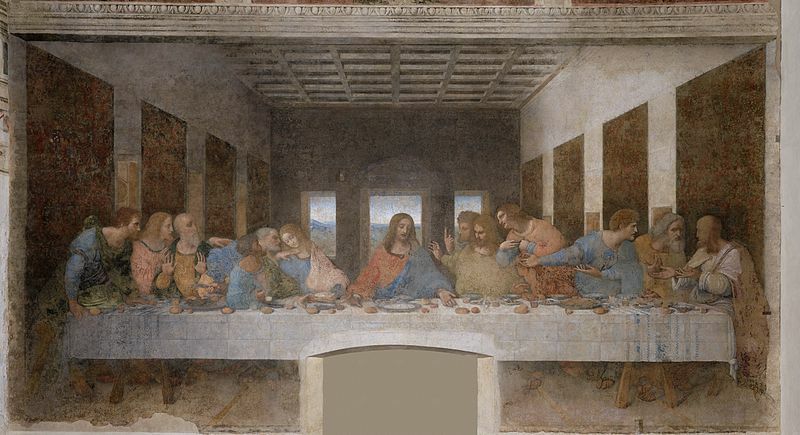 Tickets to see the Last Supper at the Santa Maria Delle Grazie, are extremely hard to come by, and must be reserved weeks, sometimes months in advance. So, the only way to see the last supper on short notice is to pay a tourist guide. Through the unassuming building of the refectory, is a security system to give most Swiss banks a run for their money. Not only are you allowed to only see the painting is groups of 15, you are allowed exactly 10 minutes within which to do so. You must first pass through a chamber that seals you in and balances the humidity levels of the group. The next chamber regulates the dust and particulate level and the last chamber regulates humidity again. Finally, after you are deemed purified enough to enter the chamber with Da Vinci’s masterpiece, you come face to face with the reason for this level of preservation. The mural covers an entire wall of the refectory. You will notice a large door shaped structure at the bottom of the painting, that obliterates Jesus’s feet. This is due to the fact that at some point, one of the members of the church decided that there should be a door connecting this room to the next, and in a stroke of extreme “genius” he hammered a hole through the wall, which unfortunately took down a portion of the painting as well. This painting has also been bombed during WWII during which time it was sandbagged to protect it. Thanks to their foresight, the painting was saved, but just barely. Millions of dollars are spent every year for restoration studies on the Mural, but it continues to steadily deteriorate. This is in great part due to the fact that, Leonardo experimented by painting this on dry plaster, which is a very whimsical and delicate medium, and crumbles very easily. My advice- Go see it before it’s gone! Now the reason I regret having to go through a tour guide, is that, in a bid to give you your money’s worth, they tend to chatter incessantly. 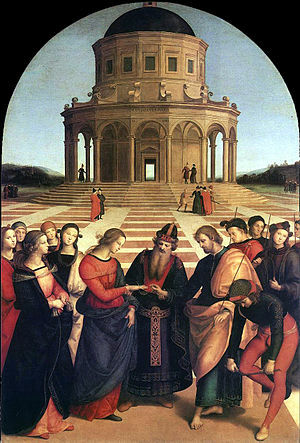 Of the 10 precious minutes you have with this painting, that will in all likelihood, not exist after another 100 years, the tour guide will prattle on and on and on, without leaving you with a single moment of silence in which to admire Leonardo’s beautiful “Sfumato” technique, and mastery of symbology. The only moments of silence I got was when the group was leaving the hall and luckily, I was the last to exit. I stole a precious 10 seconds alone with the majestic masterpiece. As I bid ciao to Signore da Vinci, I thought: If the Italians birthed both the relentless genius of Leonardo as well as the phrase “Dolce Far Niente” there must be some merit to appreciating both the immense capacity of the mind, as well as its emotional sensitivity to stop and smell the flowers. My hope is that in the midst of my busy adult life, something in the water I drank in Milan trickles through my veins and takes me back constantly to the times when I was a child, laying on the grass, and truly enjoying the sweetness of doing ABSOLUTELY NOTHING!